Picked up a Reaper figure named Jeeves, Clockwork Robot. Kind of has that Steampunk appeal to it. He is a little tall standing almost 2" high. I am trying to figure out how to paint him. 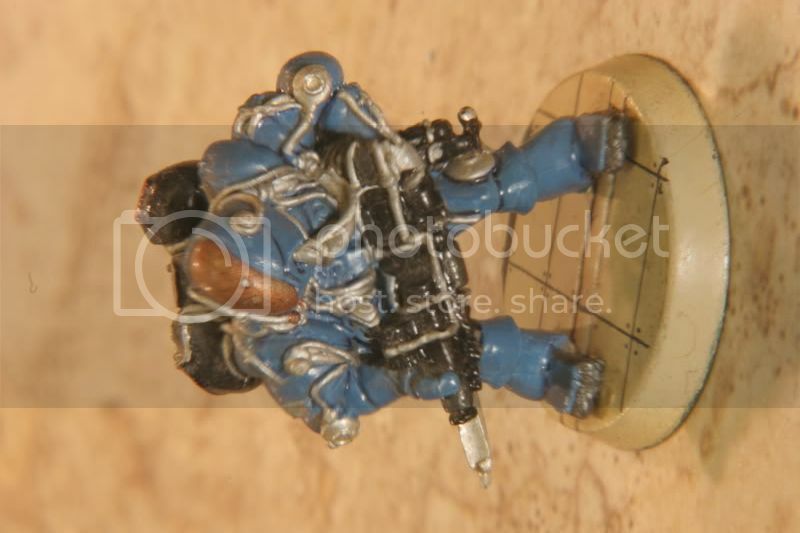 Now remember, I don't usually paint figures, especially not this small. So, any hints, tips, etc are greatly appreciated. Debating on going with a brass look, rusty look or the full chrome look. Well if it's Jeeves then Black body and legs, with white "hands" and collar, very shiny black shoes and a polished brass "face"
Looks a little bit like Bender from Futurama. That has a Tik-Tok Man look to it. Ok, trying to get something done for the Nats and figured (hah, punny) I would give him a go. Picked up a can of Testors One Coat Lacquer Bronze at Hobby Lobby today (which was another incentive to do this). Here he is after a spray. Found a bit more flash to clean up them will give him another touch up. Thinking Aluminum for the silvery bits and then got to give some life to those eyes. Yellow would really pop them but may be too much. Might just put a little clear Amber over the Silver. Opinions? Got some brown, black and orange wash mixtures that I will give him to add that used look and see where this ends up. Now, how to do the base? Dirt and grass would be the quickest but kind of like a road or floor finish. Looking good You coudn't fit a tray with something suitable on the raised hand could you ? For a quick "floor" base, just paint the base with matt colour, then draw some "tile-edge" lines on it with a pen and a ruler. make sure it'sa pigment ink pen rather than a dye-based one, or it might "creep" into the paint. Once it's dried, just give it coat of gloss varnish. For a road finish, try pasting wet'n'dry paper to the base and painting it black. Experiment first with different grades to get the texture you want. and some a little bigger. I have that guy too. You did a great job with him! Appreciate that. Not too bad for my first wargame fig. Still need to do something for a base. Got a set of Starfleet Battles TNG Away Team (with Worf) that I keep wondering if I should sell the set or at least try and do Worf.